Deeply rooted in our history, Essilor’s principles and values unite all Group employees and form a solid foundation for sustainable growth. The challenge of our mission also brings responsibilities: it requires strong levels of quality and innovation, exemplary professional obligation and social commitments. 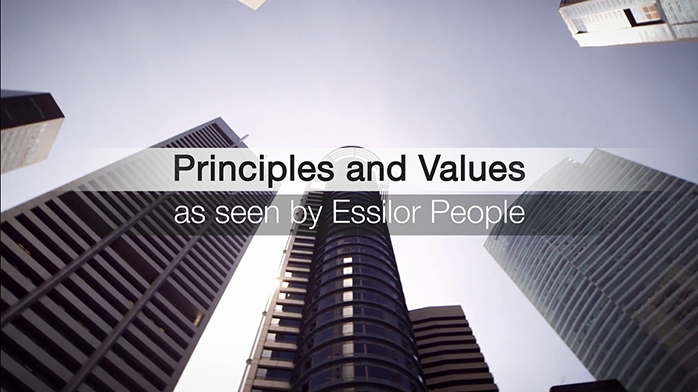 An historical legacy, Essilor’s 5 values are essential elements of our identity. They are embodied daily in the way our teams work together. Working together strengthens our company’s performance and enables us to maintain a dynamic of permanent evolution. Collective intelligence drives our progress. Innovation concerns all aspects of the company: technology, manufacturing, sales and service. Innovation to promote access to visual health for a maximum number of people is what drives our development. Respect and trust are at the heart of our human relationships and foster commitment. Encouraging initiative and empowering individuals are part of Essilor’s founding characteristics. Our diversity and the value we place on differences are strengths that create value through embracing multiple viewpoints and enrich our human experience. They support our geographic expansion and how we adapt to local cultures.